A free Souvenir compact disk featuring the stars of the November 21st OHEL Benefit Concert will be given to all Concert patrons and guests the evening of the major event. Created specifically for this concert, the one of a kind, more than one-hour CD features a compilation of favorite songs and melodies performed by these talented entertainers. Others who will receive the complimentary CD also will include benefactors, sponsors and friends of OHEL. Some of the brightest stars in the Jewish musical world will fill Alice Tully Hall at Lincoln Center with the best in popular and Chassidic Jewish music. 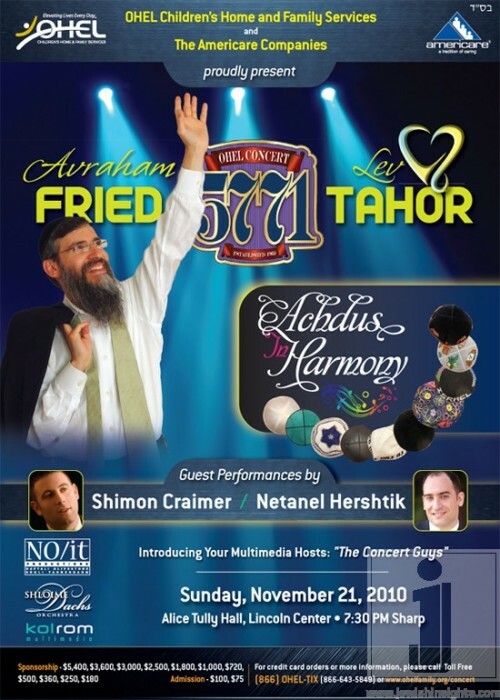 Headlining the stellar night are Avraham Fried, Lev Tahorin their first-ever concert performance, Shimon Craimer, and Netanel Hershtik and the New York Choir, accompanied by the Shloime Dachs Orchestra. Besides many favorite melodies, new and original compositions are planned for the evening, as well as special musical surprises. Many of these will be pre-recorded and featured on the CD giveaway. The entire evening, called “Achdus in Harmony” will be an uplifting celebration and a tribute to the children and families of OHEL. Be part of a multi-media and live performance experience. The Concert is an A Dove/No/IT Productions and Kol Rom Multimedia Production. Proceeds of the Concert will benefit the thousands of children and families served every day by OHEL, Bais Ezra and the Lifetime Care Foundation. Whether it is a child with developmental disabilities, an adult with mental illness, an abused or neglected child, an older adult – all find needed services at OHEL’s myriad locations. For more than four decades, at every age and stage of life, OHEL has been there for our community and will continue to be there. The primary sponsors of the evening are The Americare Companies and its principals Elly and Brochie Kleinman. Elly and Brochie are long standing friends of the children and families of OHEL and we are proud to partner with them and bring this cavalcade of stars to Lincoln Center. Other major sponsors include Garden Health Care, Capital One Bank, Senior Care, Kosher.com, Gourmet Glatt, Nut Ola, Kosher Delight, Meridian Capital, Air Mark, Red Rock Outdoor, Oh Baby, and J & R Music and Computer World. OHEL is proud of the stars that have joined to make this Concert a success. The past five years were sold out and hundreds of tickets were pre-sold. Please buy your tickets early! You won’t want to miss your favorite performers and our special multi-media production!